You can create a virtual machine with a static public IP address. A public IP address enables you to communicate to a virtual machine from the internet. Assign a static public IP address, rather than a dynamic address, to ensure that the address never changes. Learn more about static public IP addresses. 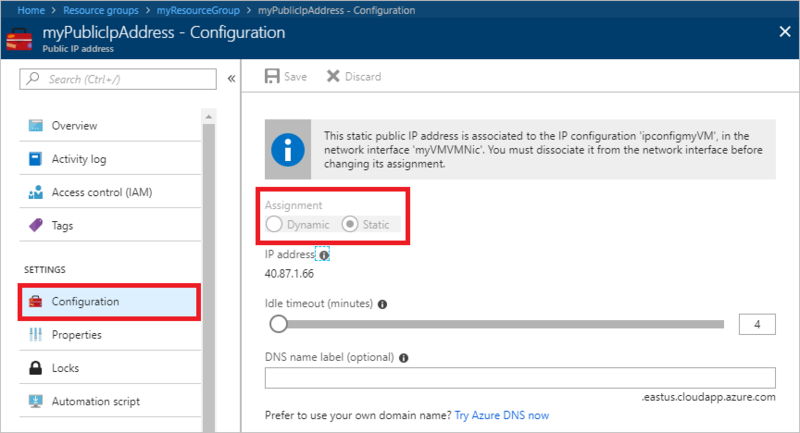 To change a public IP address assigned to an existing virtual machine from dynamic to static, or to work with private IP addresses, see Add, change, or remove IP addresses. Public IP addresses have a nominal charge, and there is a limit to the number of public IP addresses that you can use per subscription. Do not modify the IP address settings within the virtual machine's operating system. The operating system is unaware of Azure public IP addresses. Though you can add private IP address settings to the operating system, we recommend not doing so unless necessary, and not until after reading Add a private IP address to an operating system.